Nick Norman's study of bats on his property in early July. Earlier this year, Meramec Aggregates applied for a conditional use permit from Franklin County to allow the company to perform mining operations in an area that spans more than 70 acres near St. Clair, which is about 50 miles southwest of St. Louis. In May, the company withdrew the permit when County Counselor Mark Vincent wrote to the Planning and Zoning Commission and said the county has no jurisdiction over the area and therefore, no power to regulate the construction of the mines, hours of operations and other aspects of operation. "No one really wants a mine in their backyard," said Nick Norman, a St. Clair resident who leads the group. "There's going to be a lot of pollution, noise, and [it'll] disturb the Meramec River." This year, Norman began to see an unusually large number of bats near where he lives along the Meramec River. "We see three to five bats a second. Ten years ago, they were rarely ever found," he said. Norman said he spoke to a Missouri Department of Conservation official who pondered whether he was seeing the endangered gray bat. This was confirmed when he and scientists gathered on his property on an evening in July to collect bats. "We put up a net at 8:30 p.m.," he said. 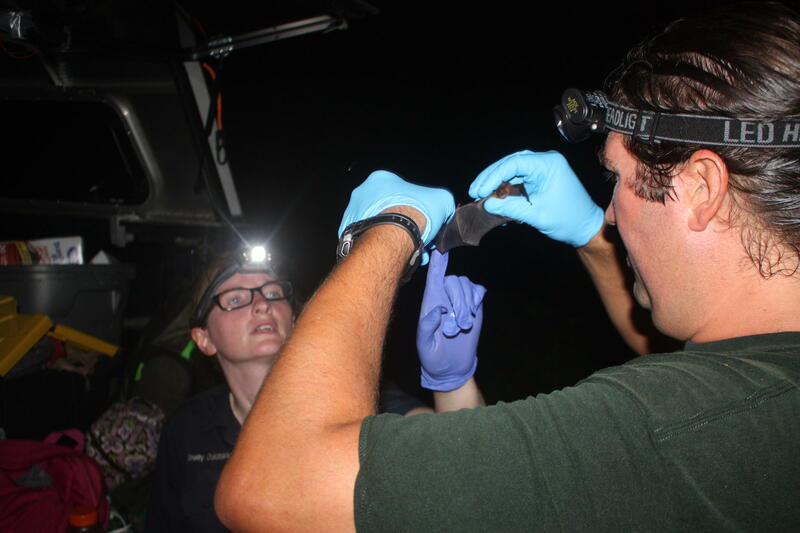 "We caught our first gray bat at 8:35 p.m. And within 15 minutes, we had to take down the net because it had become so over weighted with bats." Norman also has a background in animal science — he graduated from Northwest Missouri State University with a degree in biology. and founded a nonprofit organization to rescue exotic animals. A cave where many bats live is located less than a mile from the gravel mines, Norman said. Before the study on his property, U.S. Fish and Wildlife Services biologist Jane Ledwin sent an email to Norman that said the mines are "far enough away from any records of listed species in the adjacent river." Like other bats, gray bats consume bugs, such as mosquitos, and help farmers reduce pesticide use. "You know you have a very strong, well rounded ecosystem when there is a bat population," Norman said. "And that could be significantly disrupted by [the mines]." Correction: An earlier version of this report incorrectly identified Meramec Aggregates. That version also misstated when St. Clair resident Nick Norman spoke to biologist Jane Ledwin of U.S. Fish and Wildlife Services.